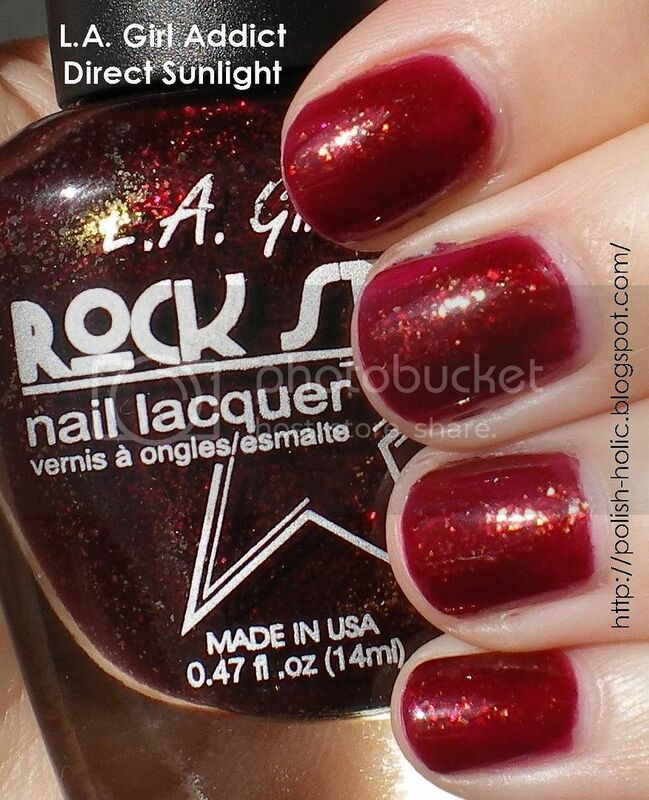 This is from the Rock Star collection and OMG I am in love. *Floats around with hearts trailing after* I would get a back up of this beauty if Cherry Culture's shipping weren't so obscene now. This is two coats and top coat. Sorry for the crappy cleanup job. But I was in a hurry. This is really well pigmented, so it's a bit thick, but nothing you can't work with. *Sighs happily* So perdy. Omg I love this color. I need to go dig it out of my stash and wear it again. 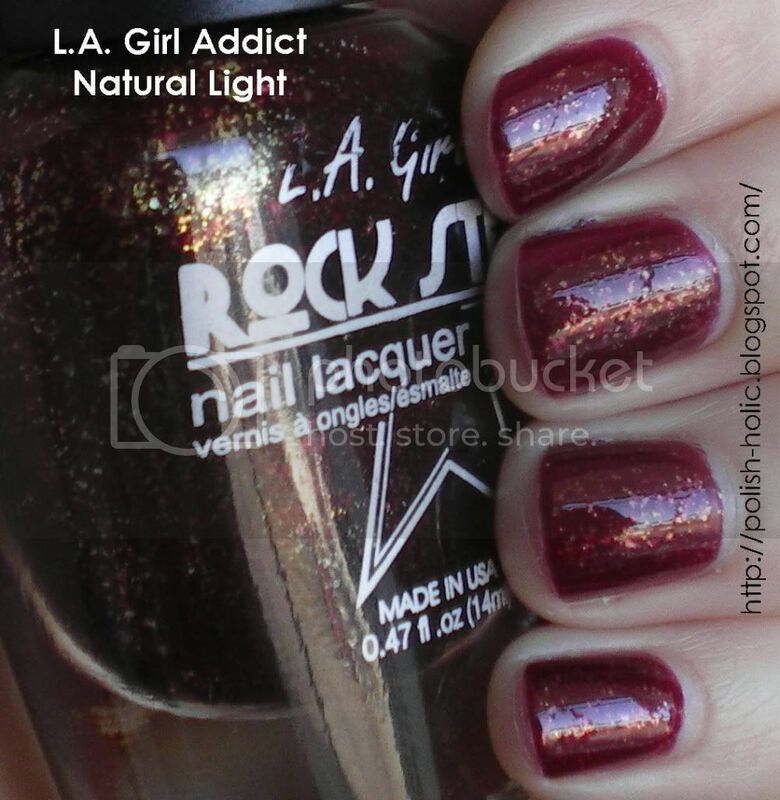 And silly me, I saw "Direct Sunlight" on the middle pic and thought "when did they start printing that on the bottle?" My only defense is it's late and has been a very long day, lol. What a pretty color! I still haven't tried a flaky polish yet...but hopefully soon! Lol, this is a great diversion from the St. Patrick's manis, love it! Fabulous colour and flakes! I don't have many flakies but love them all - and so much easier to remove than glitters! Oh man that is GORGEOUS. I don't blame you for not posting green on March 17th. I didn't really want to but it just happened. Ah well. That is a fabulous red on you! Kitty: Lol, I totally have those moments too. No worries. SeeingSunshine: I'm not too too into flakies, but I must admit, I love this one. Cali369: It's odd, but totally true. Totally easier to remove than glitters. I wonder why that is. WizardsOfBling: At least this one is relatively cheap. Lol. Stephanie: Yeah, I can't believe it, but I just totally got sick of green. Halifax: Omg, that would have been awesome. I would have asked you to get the majority for me. I'm surprised how much I love them. ooOOoo, very nice indeed! I've been leaning towards the lighter colors in my stash (which is weird for me, even if it is Spring), but seeing this makes me want to sport a vampy, juicy looking red!